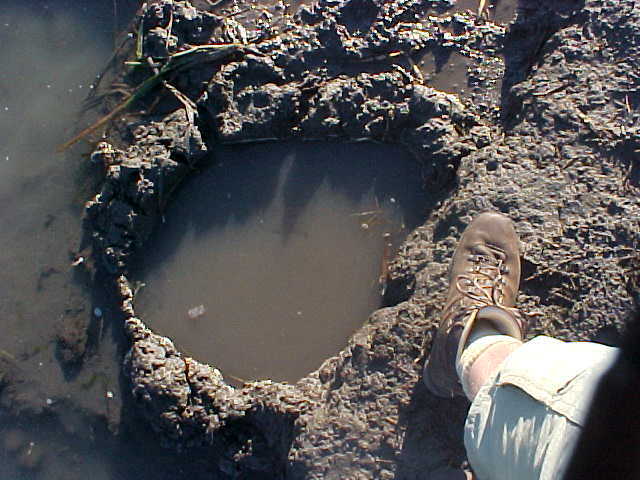 From Johannesburg I flew off to the Manyeleti Game Reserve, where I had a fascinating safari (game) drive. Suddenly I was surrounded by wildlife, suddenly I was in a position of how humans are supposed to live. Together with wildlife, where the kingdom of the animals have priority and where zebras play for modern live zebra crossings. Coming through, coming through! A telephoned wake up call made me awake at 7pm this morning at the Ten Bompas hotel. I had a quick shower and checked out of the hotel. Garth Wolff from eTravel picked me up so I could finish the uploading of my latest photographs at the eTravel office. But next to the 14k4-connection at the hotel, it failed again this time too. Too bad. Got to go again. 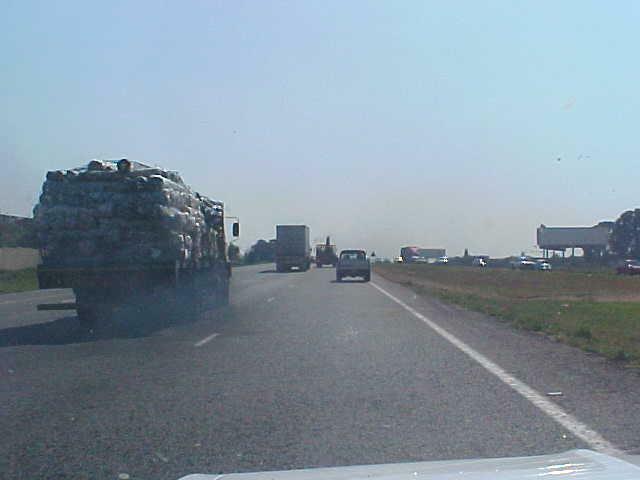 At 9 am Rodney, the messenger of eTravel, drove me to Johannesburg airport and we past the previous slums of Johannesburg which have been almost cleaned. The economy is doing better since the big change from Apartheid to Democracy the last ten years. Those who can not afford a home get a chance to get a house from the state. 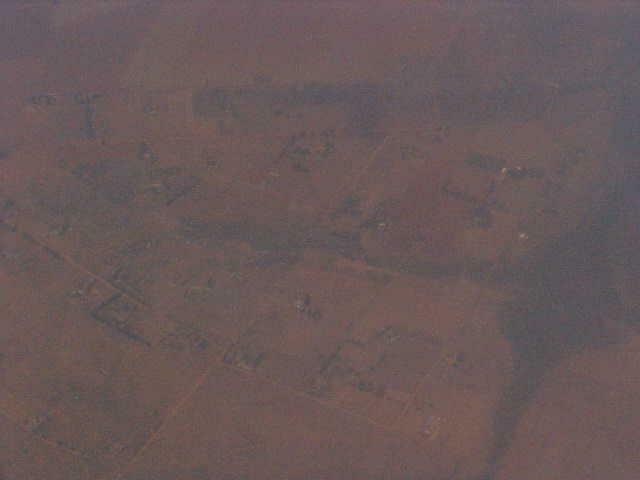 Johannesburg (aka Jo'burg or Joeys) is the largest city in sub-Saharan Africa. It is a very modern, bustling metropolis that powers the country's economy. 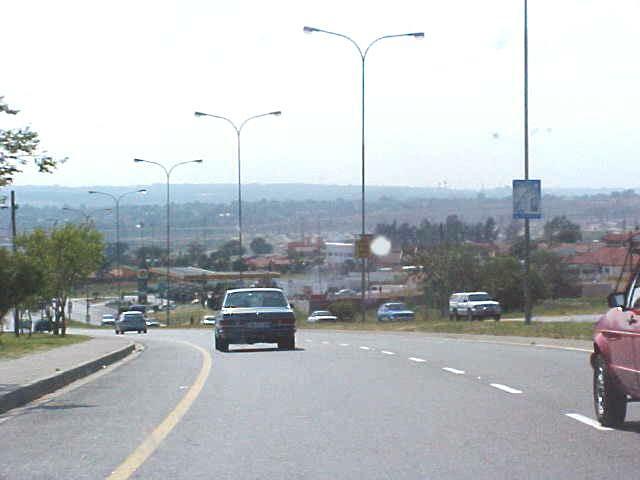 Home of over 6 million people, it the city sprawls across the featureless plains of the mile-high highveld, spawning endless suburbs that threaten even Pretoria, more than 30 miles distant. "It feels like Los Angeles in the veld, as visitors seem to leave it almost as quickly as they arrive," said Garth to me yesterday. 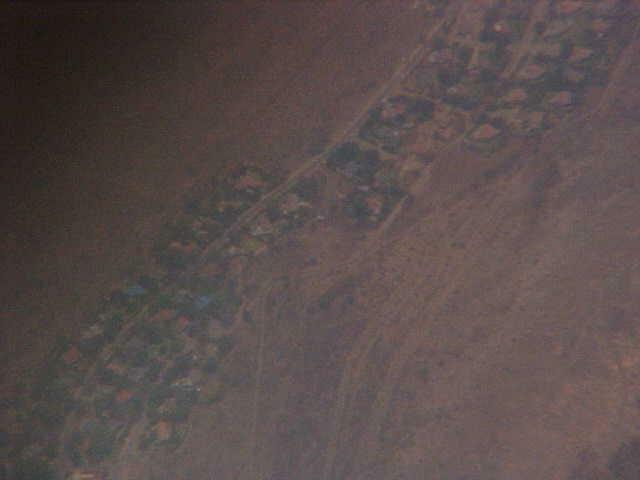 During the course of the last century, British and Irish fortune hunters, many of whom became wealthy mining magnates and settled in today's Parktown suburb, together with millions of blacks from South Africa, Mozambique, Zimbabwe, and Botswana, made the long journey to I'Goli (a Zulu name meaning the place of gold) to work in the gold mines. Now, more than anything else, gold has brought about the urbanization - and politicization - of the black population. People follow money, and Johannesburg became a magnet for hundreds of thousands of unemployed rural blacks. 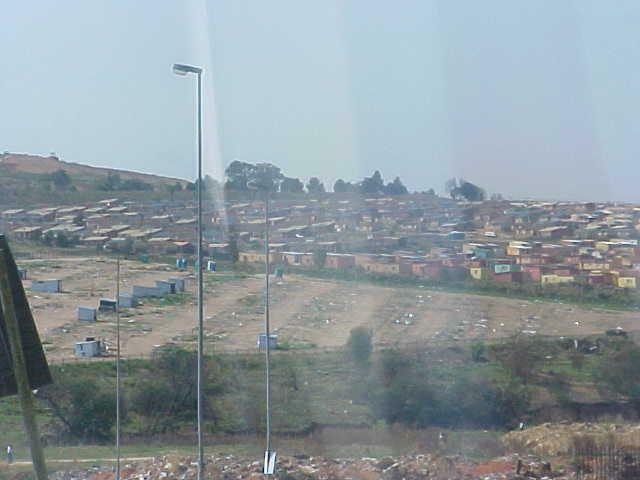 By the start of World War II, huge squatter camps - the precursors of townships like Soweto (an abbreviation for southwestern townships) - had sprouted on the periphery of the city. By the 1960s, township poverty and overcrowding had become the kindling onto which South Africa's hated apartheid legislation poured petrol. In June 1976, police fired on Soweto students protesting the use of Afrikaans in schools, and the townships burst into flame. More than 1,000 people lost their lives in the year of rioting that followed. Ten years later the townships were ungovernable, and the country began its slow movement toward civil war. Now, under South Africa's first democratic government, the word is out throughout Africa, and blacks continue to pour into the city. And like the first miners who rushed to stake their claims here, they have gold fever. Everyone, it seems, is out to make a buck. The sad truth, however, is that there's not enough to go around as the masses continue to flood in, with overcrowding and certain slums being the unfortunate result. Nevertheless, the city thrives on an invisible energy, an explosive combination of need, greed, and ambition. Since the destruction of the Apartheid regime (Apartheid is Dutch for Separation) in the 1990�s people started to integrate (the white people learned to integrate) but those without a job and still living in the township turned to crime. Especially when white people came into �their� areas. 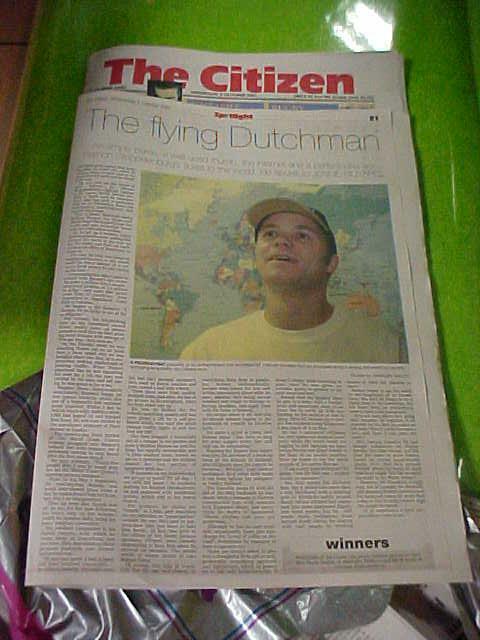 Rodney lived in Pretoria, the administrative Capital of South Africa, but moved out because of the high crime rate. Anybody in a car with a tie is seen as somebody with money. Car highjacking is at some places a common thing. 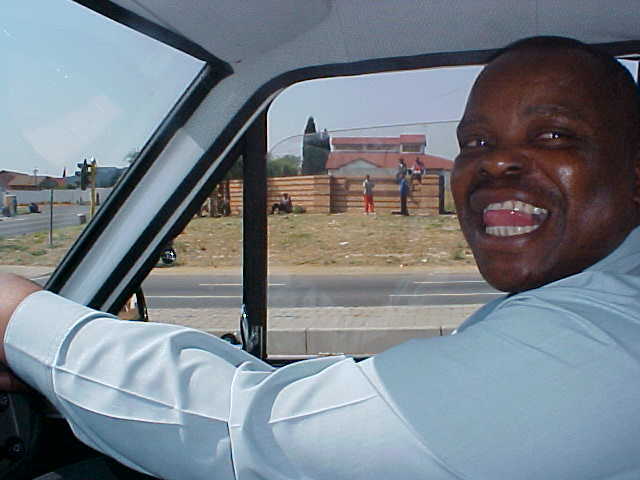 Rodney tells me that crime is a big problem and said it might be true that a white person should not have his white arm hanging out of his car window as he would just be waiting to get mugged, if he�d drove through a black majority area. I noticed how Garth and Lesley-Ann lock their doors in routine to prevent anyone to come in the car to rob you from your car with a gun. It is all contradicting with what I heard earlier this week. 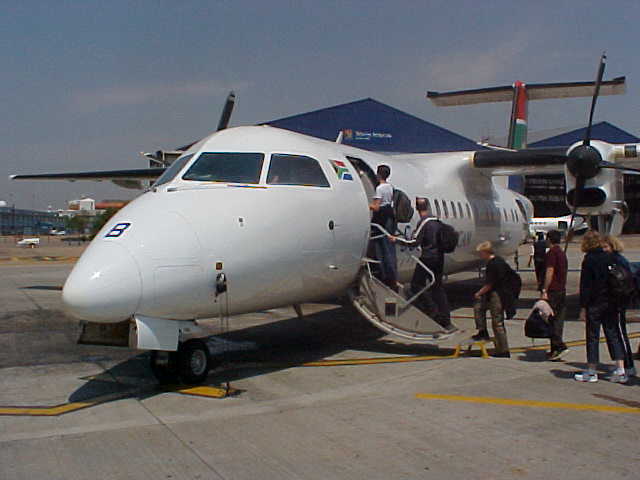 At Johannesburg airport a small propeller airplane of South African Airways, brought me within one hour to the East Side of South Africa, near the Kruger National Park, at Hoedspruit airport. High in the sky I was impressed by the different sights of the land below. Vast deserts with small vegetation goes on and on, but suddenly the land became greener where there was a river valley coming up. 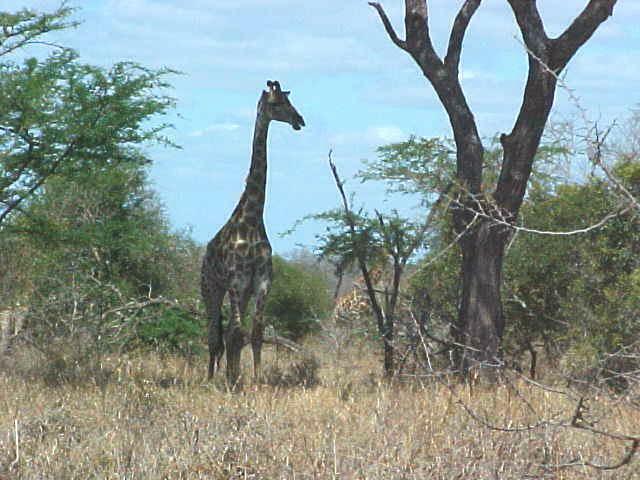 As the plane descended and prepared for landing I noticed the dry bushes and even saw a single giraffe near a water dam. When the plane landed on the landing strip I even saw two lions in the bush, looking bored at the plan passing by in high speed. Suddenly I was totally in the middle of the wildlife. 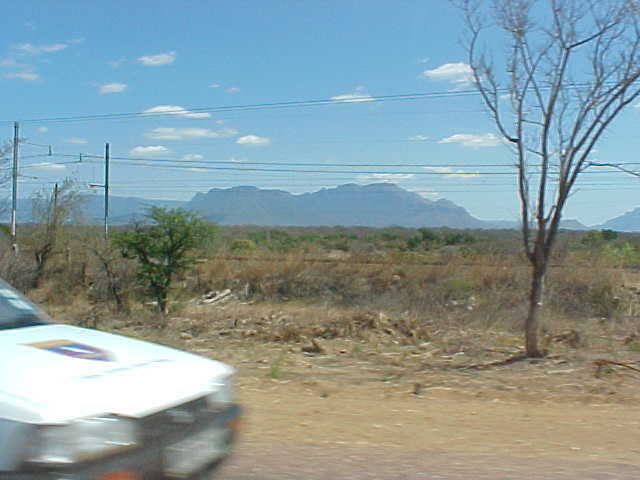 The airport of Hoedspruit is nothing but a paved runway and one building. As I boarded off the plane I had to adjust my eyes to the brightness of the sun and I felt the dry hotness burning on my skin. Together with some other guests of the Honeyguide Tented Camp a driver brought us to the campsite in the Manyeleti Reserve in about 40 minutes. 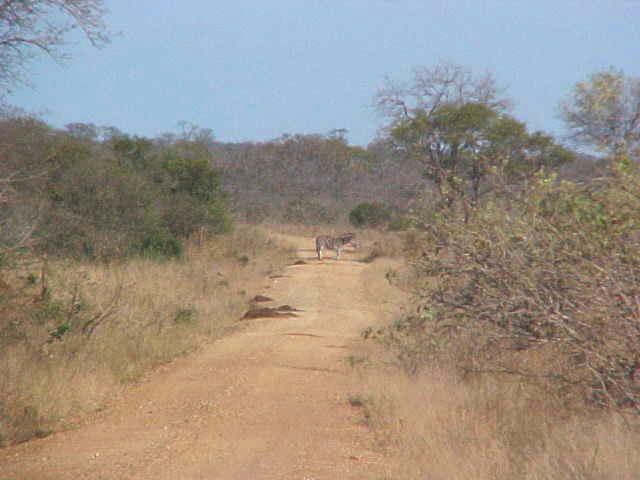 Along the road the landscape was just endless bush with occasionally some buffalo�s walking around. 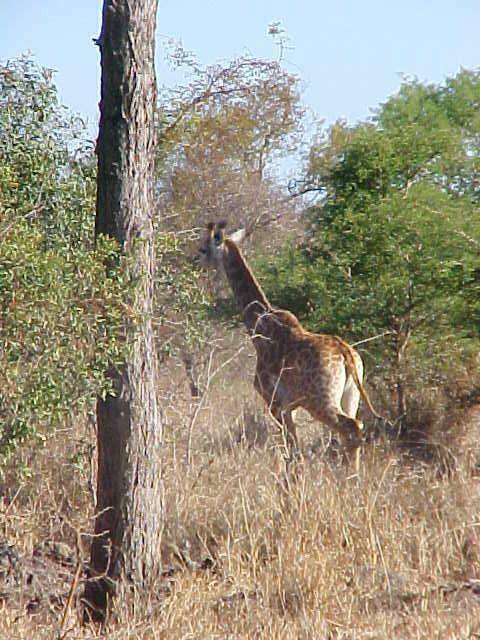 As we approached the campsite the car stopped and suddenly I looked up, eye to eye with a giraffe along the sandy road, just 10 feet away from me. 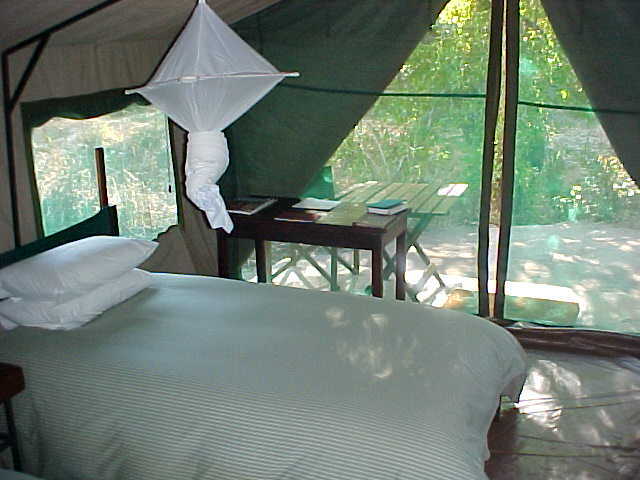 Honeyguide is situated in the Manyeleti Game Reserve which is wedged between Timbavati, the Kruger National Park and Sabi Sand. Honeyguide is located in a 10,000-hectare private concession within the 24,000-hectare Reserve. 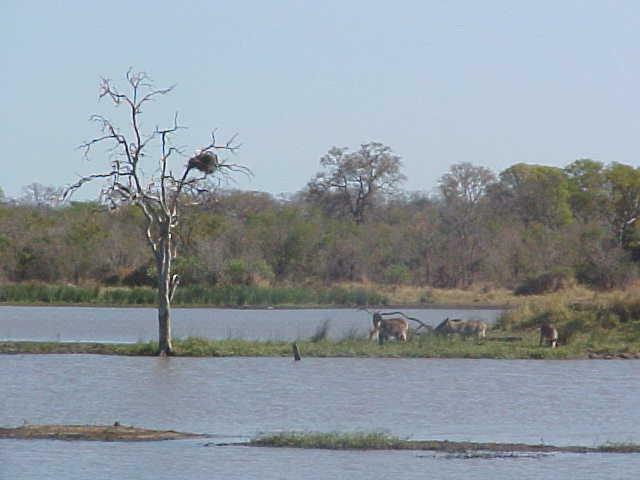 The concession is a prime Big Five area where the Big Five (buffalo, leopard, elephant, lion and rhino) are often seen. 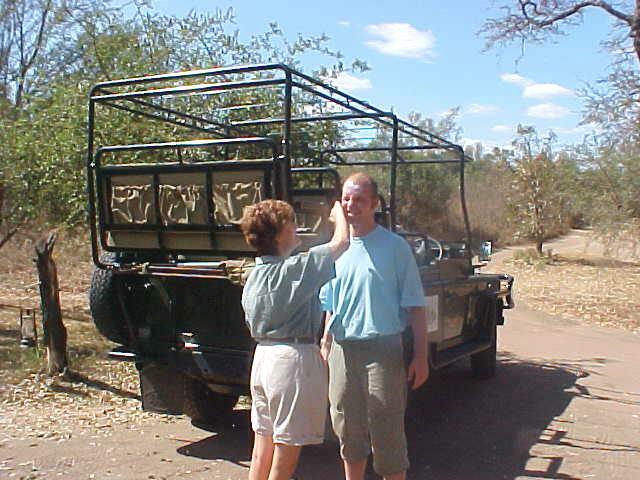 When we arrived at Honeyguide the crew politely introduced us here. 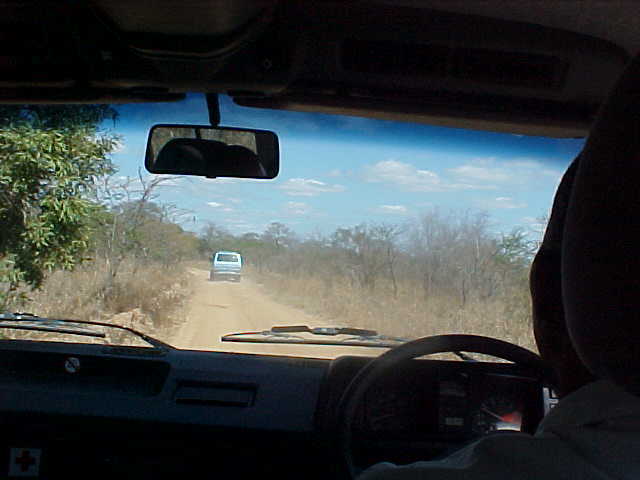 My luggage was taken out of the mini van and I was immediately scheduled to have a private game drive through the Reserve. 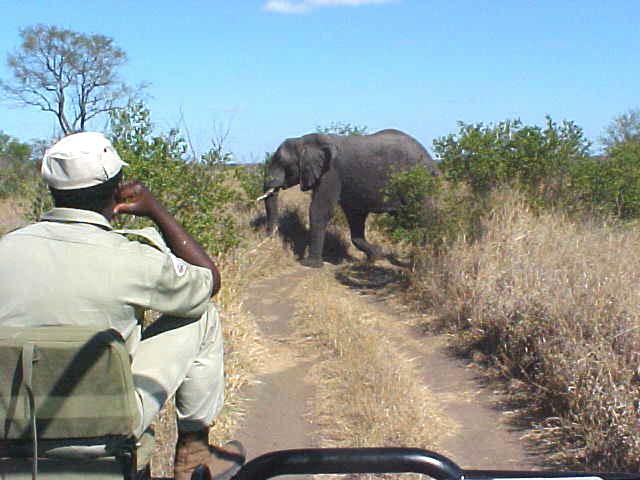 It was mid-day and as the Landrover drove over bumpy trails with ranger Philip sitting up front of the car. The land was dry and with springtime coming up it would only need one day of rain to completely flourish and become green instead of dry yellow. 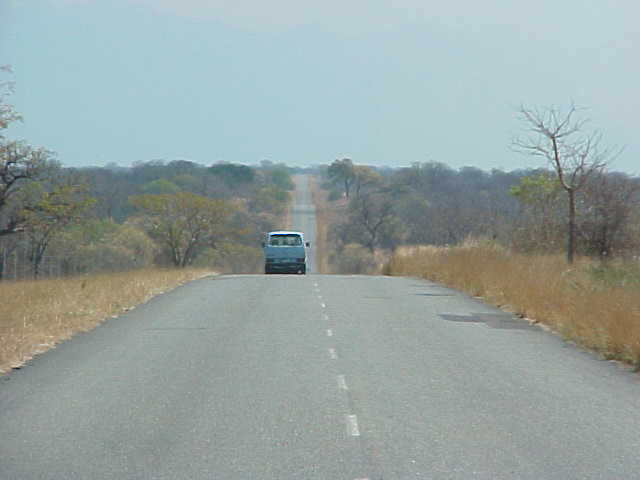 The landrover drove from waterdam to waterdam, as that would be the place where most animals would hang around at this time of the day. 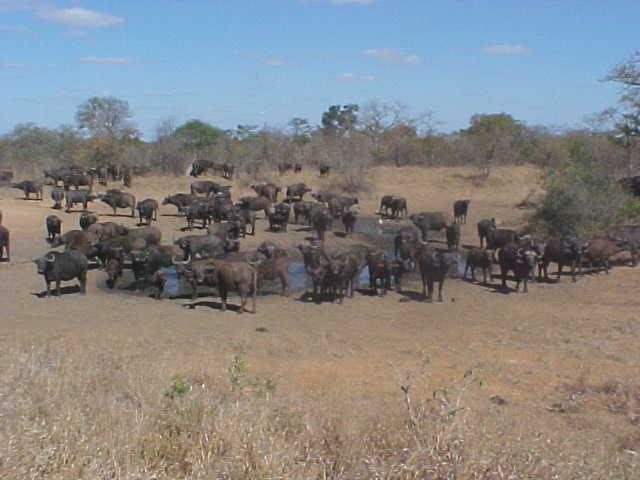 At the first dam I was confronted with a herd of buffalo�s. Along the way to the next pond I saw a small steenbuck ducking down near the car, and loads of antelopes crossing the road. Baboon monkeys were on their way to find water as warthogs (you know Pumba from The Lion King) were chasing each other through the high grass. A zebra was standing in the middle of the road, waiting for nothing. Talk about a live zebra crossing! The rover stopped again as a bull elephant come towards us, crossed the road and continued its journey while making orchestral noises with his behind. 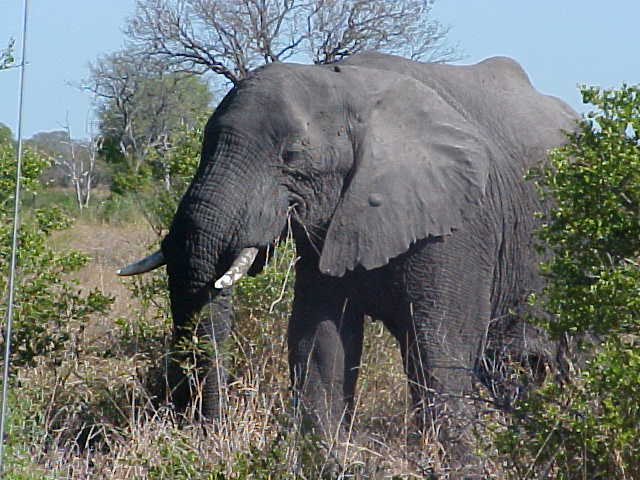 I can now say I have smelled a fart from an elephant (elefart) and it smells great (�). 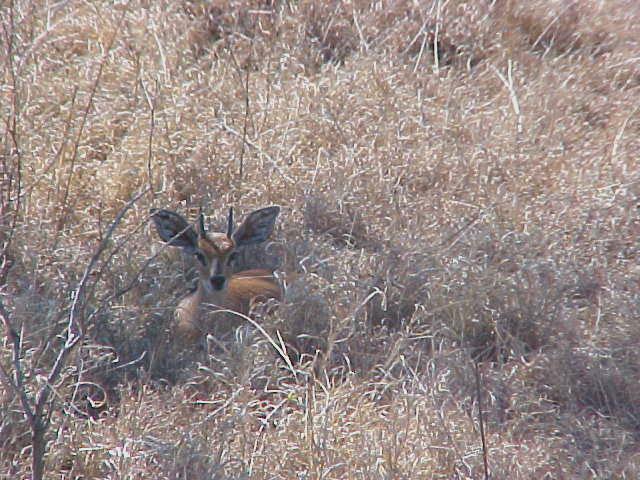 At the last and biggest waterdam I saw impala�s and waterbucks drinking water and eat the grass. One of them was on the outlook, always prepared to run when needed. Along the water on the other side of the dam a lioness was watching them. 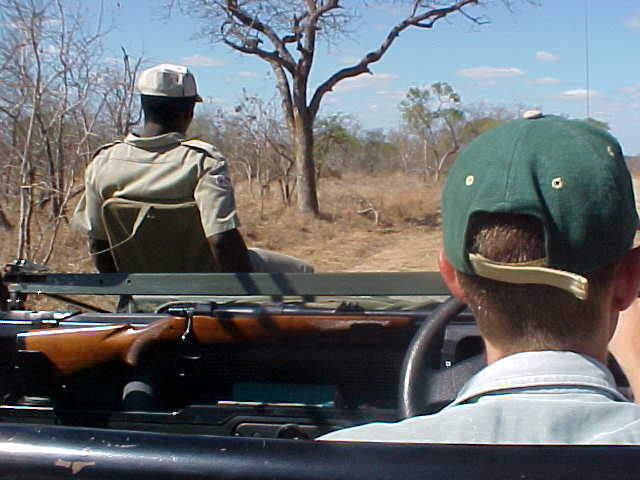 The driver, Andy, was informing me about the lifestyles of different species and told me there would probably be an ambush of lions as soon as the impala�s would leave the waterfront. Nothing happened for our time being there, but it was just fascinating! 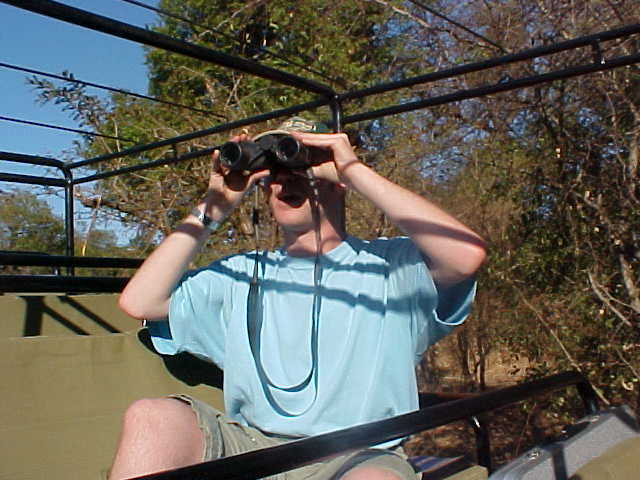 I can say I have seen three of the South African Big Five, but I will be here another day. David said I would see them anyway before I would leave again. I did see over eleven different species of wildlife passing by, hiding out or flying over. It was amazing and such an exiting experience. Back at the campsite I had a nap in my tent, which has two beds, a bathroom en-suite and hot running water. 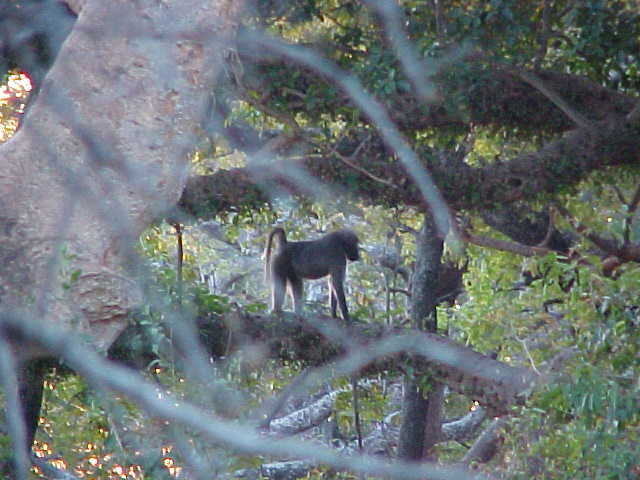 Around 6pm I was present again and [n]heard baboons climb the trees surrounding my tent[/b]. When they heard me they all just leaped from tree to try and even onto the roof of my tent to get out of sight of me as fast as they could. Together with the manager of the camp, Bertus, I drank Amstel beer (Dutch!) as the sun set down and it got dark. 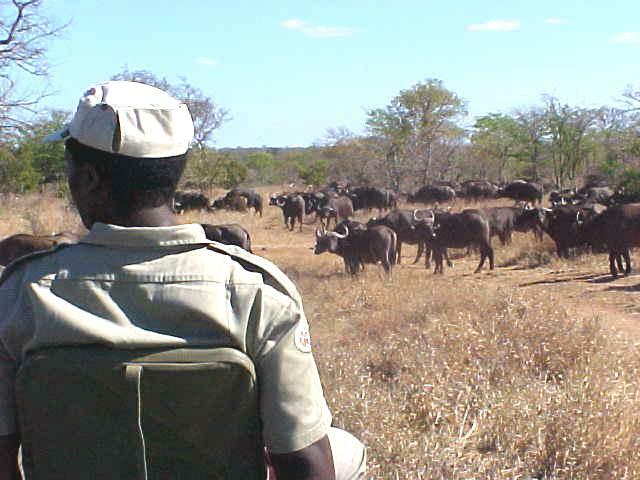 All the other guests of the camp were now on their game drive and were expected to be back at 7.30pm. Bertus has been working at Honeyguide for 15 months now, and together with his wife Karien, he never stays on one spot for more than two years. It would be someway becoming much more of the same. The guests would be the only difference. The crew would be one big family, all knowing each other too good and of course the complete Reserve could be drawn out by head. "At a certain point you know it all. You know exactly where the animals are at a certain time, it won't just be fun anymore. And that is what it is all about. I want to wake up in the morning and be happy with what I will be doing." In order to be challenged every once in a while they manage another campsite every two years. 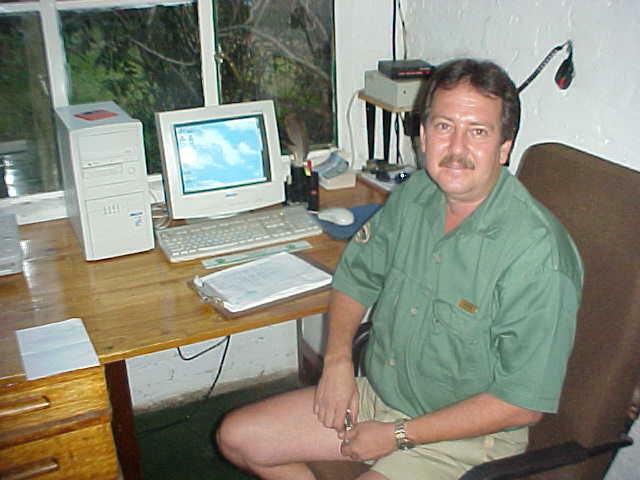 Bertus loves the work he does, he likes to be busy, but not too and is happy with the people who all work here. But the routine can make it all boring. And that is the moment to say Stop. At 8pm everybody gathered at the central thatched bar, with an open dining room and lounge as the beat of a drum would call everybody. 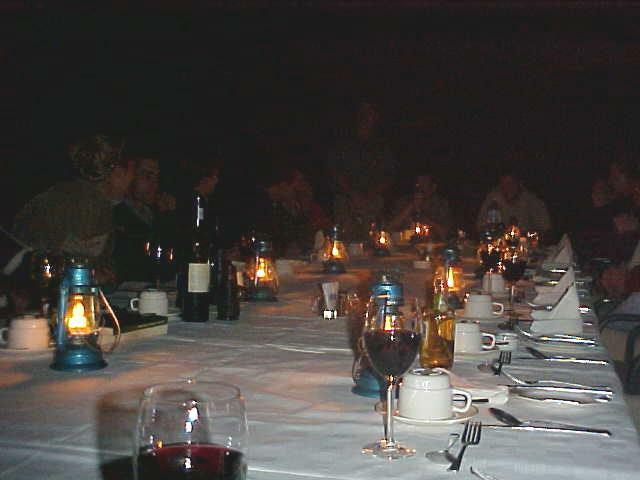 We all sat on one long table in an open-air boma where we were served our 3-course dinner next to a campfire. With the moon coming up it wasn�t that dark anymore as before. 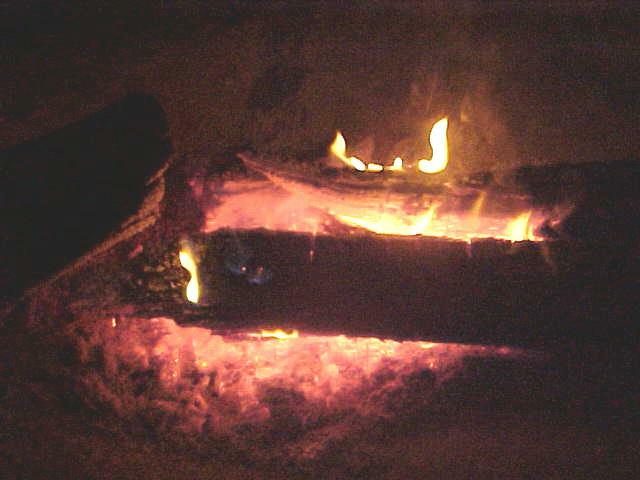 The campfire heated our backs but a sweater wasn�t such a bad idea. Before dinner started Bertus gave an amusing introduction, introducing our waiters Promise and Difference (as their names are translated from Shangan, one of the South African languages that are not part of the 11 official languages). I chatted with two Irish ladies who flew in today and with a couple from London who where on their honeymoon. We were all very intrigued about being a part of this wildlife here. After dinner most of the people got back to their tents. So overwhelmed probably by today adventures I guess. As nobody is allowed to walk back to their tent without an armed guide, the crew of Honeyguide played for guarding human taxis, leading everybody to their beds. Occasionally a lion would frighten people, as they would freely walk around, the crew told us. Not that that would be dangerous, but the lion will jump you when you scream and run away. Once in my bed, under a mosquito net, the sound of nocturnal nightlife kept me awake for a few hours. I just did not want to fall asleep. I wish I could tape these sounds for you as nothing in the world sounds that majestic than this. This is a life time experience as I won�t get any closer to wildlife like this again. So indescribably impressive this is. And I did fall asleep� Damn! Honeguide Tented Safari Camp is part of the Classic Safari Camps, an association of independent, privately owned camps and lodges in East and Southern Africa. Each of these unique establishments offers genuine hospitality and an intimate knowledge of Africa's natural environment, and is dedicated to conservation and the involvement of local communities - sharing and conserving the Spirit of Africa.